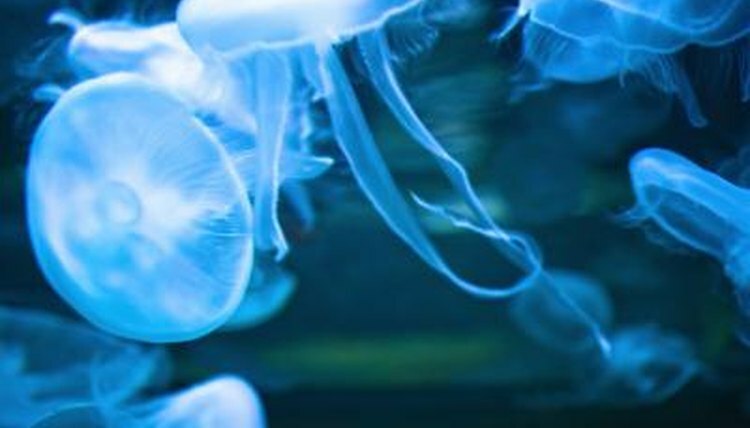 A combination of translucence and radial symmetry gives jellyfish an ethereal quality that may elicit wonder, especially in the case of bioluminescent species. Conversely, you may shudder at the thought of being stung by its tentacles. When some marine animals spot one of these organ-less, gelatinous invertebrates, however, they see a meal. Very few species can safely consume jellyfish, which, though venomous, are 95 percent water. The marine turtle species that preys on jellyfish the most is the leatherback, named so because it lacks the hard, external carapace that is characteristic of its relatives. The world's largest turtle with lengths of up to 6 feet, the leatherback has jaws with sharp edges that are not designed for crushing prey with hard shells, as other sea turtles do. Leatherbacks therefore feed mainly on jellyfish and other creatures with soft bodies. Downward-pointing spines inside the leatherback's esophagus keep jellyfish from slithering out before the turtle has a chance to swallow them. Other species of sea turtles also prey on jellyfish, but to a lesser extent. At around 5,000 pounds, there is no heavier bony fish in the world than the ocean sunfish, or mola, for which jellyfish are the food of choice. This enormous and odd-looking denizen of the deep, whose shape National Geographic describes as "bullet-like," consumes a variety of jellyfish species, including moon and comb jellies. Inside the mola's relatively tiny mouth are two teeth plates that are often likened to a bird's beak. Because they do not chew, ocean sunfish break down jellyfish by sucking them in and out of their mouths repeatedly. The ocean sunfish's digestive tract has a slimy, viscous lining that is believed to prevent it from being stung by its prey's tentacles. The bearded goby, a fish species found in the waters off the coast of South Africa and Namibia, consumes jellyfish in what scientists believe is a recent adaptation to drastic changes in its environment. In doing so, the bearded goby has helped prevent an ecosystem overrun by jellies from becoming a dead zone. Jellyfish also account for part of the diet of a few fish considered generalist feeders, including spiny dogfish, butterfish, swordfish and some species of salmon and tuna. In the eyes of a leatherback turtle or an ocean sunfish, plastic debris such as shopping bags can resemble jellyfish. Plastic, however, can obstruct an animal's digestive tract, causing death. Such pollution is among the reasons why leatherbacks are critically endangered, according to the International Union for the Conservation of Nature. The decline of leatherbacks and other jelly predators -- the Atlantic bluefin tuna, for example, is endangered -- allows the jellyfish population to proliferate unchecked. Abnormally large swarms of jellyfish cannot only make swimming at popular touristic beaches dangerous, but have also undermined fishing and industrial operations around the world.